Llanberis is the kick-off point for its namesake path, and the town has many attractions. One of these is the Electric Mountain, which pumps water from the lake up to a reservoir above at night (the off-peak period), then at times of high demand e.g. the end of Coronation Street or an international football match, it lets the water run down to turbines to generate enough electricity to cope with the extra demand. There are tours starting from the main visitor centre (these are very popular, and you may have to wait at busy times). Other spots to take in include the slate museum, the lakeside railway, steam and motorboat rides on Llyn Padarn, Dolbadarn Castle, the miners' hospital museum, the sub-aqua diving centre, and many picnic areas and play areas. It’s worth considering a day wandering around these during your visit and they combine to make Llanberis a great start or finish point to a hike up the hill. The path itself is well signed from the Victoria Hotel. This is the most popular and busiest of the routes I have done, and it is well defined for most of the way, following the train tracks. Whatever the time of the year, you will have a job avoiding the many charity parties raising funds by climbing it! It’s well worth the effort for the fantastic views on clear days, especially the views over Llanberis and Llyn Padarn. 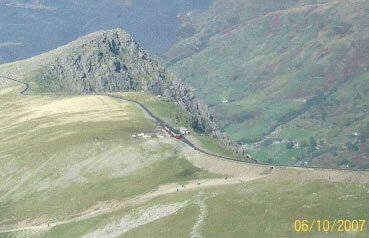 This route starts from opposite Pen-y-Pass YHA, by the visitor centre and café. Quite a few of the Snowdon Sherpa buses stop here, including services from Beddgelert and Llanberis, so it’s an easy spot to reach. The path, which was originally used to bring copper down from the mines within the mountain, runs below Pyg Track. You pass Llyn Teyrn, the first of three lakes on route, early on; look for the ruins of the miners’ barracks on the shore. After turning a corner, you pass the largest lake on the mountain, Llyn Llydaw. The causeway has been raised after frequent flooding, and passes the old mine buildings. Up to now, you have been following a meandering track, but be prepared for a surprise: hundreds of stone steps pass the third lake, Glaslyn, as the Miners’ Track meets the Pyg Track (visible in the photo). Turn left to reach the summit. 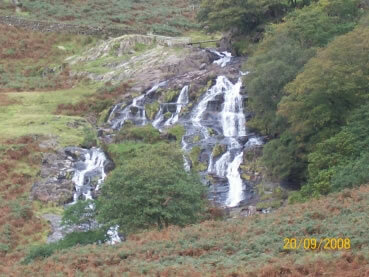 This route, on the southern side of Snowdon, starts opposite Pont Bethania between Llyn Dinas and Llyn Gwynant. It’s served by the Sherpa buses that run between Betws-y-Coed and Beddgelert. This is one of the longest routes, but also one of the most attractive. For the most part, it’s a relatively easy, steady climb on a well-constructed path, passing waterfalls and the Gladstone Rock where, in 1892 and at the age of 84, William Gladstone made a speech at the path’s opening. Beyond the remains of abandoned quarries there is a scramble up to the summit ridge – not to be attempted in bad weather or in winter conditions, or if you do not have a head for heights. In the photo, you can make out this stretch just below the summit complex (look for the Y shape where path splits. Before you set out, some advice: allow at least five hours for the trip up and down, more if you are not used to mountain walking. The local RAF search and rescue was the busiest in the country during the last year of service (a private company operating out of Caernarfon airport is taking over for 2015). Several people each year attempt the mountain without being properly prepared. So, take into account what time it gets dark, and note that weather conditions can change dramatically – check the forecast with Llanberis weather centre. And don't rely on the train down – they are usually booked up months in advance at weekends and bank holidays. Also, you can’t fully rely on your mobile phone, as there are some dead spots on the mountain. Wear suitable boots and clothing, and take extra – it gets colder the higher up you go. I would also advise snacks and drinks, a map, a compass, a torch, whistle and survival bag. 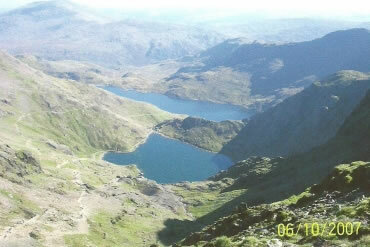 Despite its popularity, Snowdon is not a walk in the park. But tread carefully and you will have a wonderful walk, whichever route you choose.